Extreame Savings Item! Free Shipping Included! Save 46% on the Standing Desk X-Elite – Stand Steady Standing Desk | X-Elite Pro Version, Instantly Convert Any Desk into a Sit / Stand up Desk, Height-Adjustable, Fully Assembled Desk Converter (Cherry) by Stand Steady at The Daily Codex. MPN: SSUD28CHN. Hurry! Limited time offer. Offer valid only while supplies last. You've been wanting to get a sit to stand desk because it is good for your health and relieves back pain, but you aren't sure which one to invest in. You've been wanting to get a sit to stand desk because it is good for your health and relieves back pain, but you aren't sure which one to invest in. We have your solution - the innovative X-Elite, PRO Version Sit / Stand desk by Stand Steady®. The X-Elite PRO sit stand workstation fits on top of your existing desk, arrives fully assembled, and easily transitions from sitting to standing. Just open the box, put it on your desk, and boom - you are now standing! Flat surface standing desk perfectly accommodated your laptop, monitor, keyboard, mouse, and more! No assembly required! 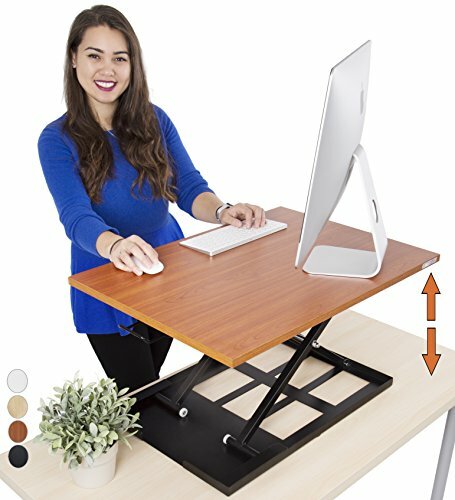 It's the perfect adjustable computer stand or monitor riser! The X-Elite PRO (Patent Pending) is from Award Winning Stand Steady® standup desks, an innovative Amazon leader in workplace ergonomics, which has been profiled by Washington Post, Forbes, Amazon and more. Clients include Fortune 500 Companies such as The World Bank. X-Elite PRO weighs 27 lbs. Max load on X-Elite PRO is 20 lbs. Coming soon four exciting colors: Black, Cherry, Maple, and White! No assembly required - what are you waiting for?! ASSEMBLED: no assembly required - just open the box and start standing! If you have any questions about this product by Stand Steady, contact us by completing and submitting the form below. If you are looking for a specif part number, please include it with your message.